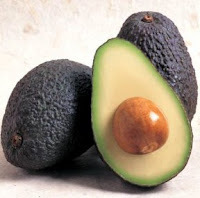 Striving Green: People must look at me and think "avocado"
Use avocado instead of butter or mayonnaise. Spread on a tortilla or flat bread when making a wrap or sandwich. Chop up an avocado and top a bean and rice dish. Or top a corn dish, like Rachel Ray's Summer Succotash. Put wedges in a grilled cheese or grilled turkey sandwich. Top a hamburger or veggie burger with some avocado slices. Add avocado to a green salad. Supplement the salad with beans or chicken. Or make an avocado salad dressing. I've made some with pureed avocado, olive oil, garlic, salt, and lime juice. Try googling "avocado salad dressing". Make an avocado crustini appetizer. That would be good topped with some fresh tomatoes and fresh cilantro. Avocados make great baby food too. Smash up some avocado with ripe banana. Our 2 loved this recipe when they were babies. If you buy a hard avocado: Check it every day for ripeness. You can put it in a brown paper bag to speed up the ripening process. You can tell its ready to eat by giving it a gentle squeeze. When it starts to "give" a little, its ready to slice and eat. Experiment with your preferred ripeness level. Don't buy squishy avocados. They are over-ripe and won't taste as good. Who knows how many times it's been dropped, or how long it's been sitting in that grocery store bin. Peel the avocado, smash it up, then add a little lime juice to keep it from browning. Put in a container as small as possible, to expose less surface to air. Cover the top of the avocado with plastic wrap. Seal it in your container. You can later thaw it and use it for dressings and sandwich spreads. But use it up fast, it won't keep forever in the fridge after thawing. If it gets a little brown on top, just scrape of that layer. There shouldn't be too much brown if you put it in a small container. 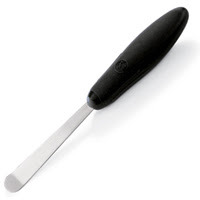 If you're into avocados like I am (obviously), try an avocado peeler. They're also great for peeling kiwi and ripe peaches. I like them just sliced or chunked with a sprinkling of coarse sea salt. Simple and delicious. I love the Peruvian appetizer called Palta Rellena, or Stuffed Avocado. The filling is carrots, green beans, and peas. Cut the carrots and green beans into tiny 1/4" pieces. Blanch and cool the veggies, then mix them with mayonnaise, salt and pepper. Pile the filling on top of peeled, halved avocados.